Each year millions of Americans choose to file taxes electronically but they differ in how they receive a tax refund. Some choose direct deposits while others prefer checks (it’s actually nice to see a check in your name from Uncle Sam). 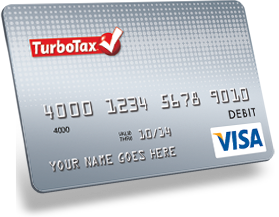 Another way to get your refund fast is by selecting TurboTax Refund Card. TurboTax Refund Card is a prepaid Visa card. It is personalized with your name and can be used anyway you want: online shopping, ATM, or paying for groceries. You can add funds to it and continue using it but it does not offer a line of credit. During the card activation process, you will set up your online account and decide on user name and password. All the steps are done on www.turbotaxcard.com and the entire process, from activation to account management, is very uncomplicated. On the website, you to check your balance and view transactions and other activity; those options are also available on your phone. How much of your refund should go on the card and how to reload it? Not all your tax refund has to be assigned to a TurboTax Refund Card. You can choose to have portion of your refund deposited directly into your checking account and the rest onto your card. Once the funds are available on the card, you will receive a text message or email and can activate the card online or on the phone. The card typically arrives in 7-10 business days from the time you sign up for it, which can be done when you finish preparing your tax return and just before you file it. Having your paycheck deposited to your Refund Card. Transferring money from your bank account. Adding cash is one of the most convenient ways to reload your card. You do it by purchasing a MoneyPak card and paying for it at the register. Those cards can be bought at many convenient locations and some retailers that carry them include: Walmart, CVS, Kmart, Walgreens, and 7eleven. The disadvantage, $4.95 service fee except for the first reload. How to avoid transaction fees. Have at least $50 balance on your card; you can opt to receive text messages with the current balance. When withdrawing money, make sure to do that from Allpoint ATM Network. Request cash back to avoid ATM fees. Refund Card lost or stolen? Identity compromised? Accidents happen and if you lose your card or it is stolen, call customer service immediately and report that event. Timing is everything and the sooner you call, the smaller you loses will be. Even though TurboTax has its own fraud-monitoring department, responding immediately not only limits unauthorized use of the card, it also shows your responsibility dealing with the situation and potentially limiting your loses to minimum. You also have an option to activate TrustedID that protects your identity by monitoring any suspicious activity to prevent unauthorized use of your card. When you get the card, log into your account and activate it. As long as you ensure uninterrupted account balance of $50, the service is free.